Mansa District has received over 27,000 insecticide treated nets for mass distribution as preventive measure against malaria. 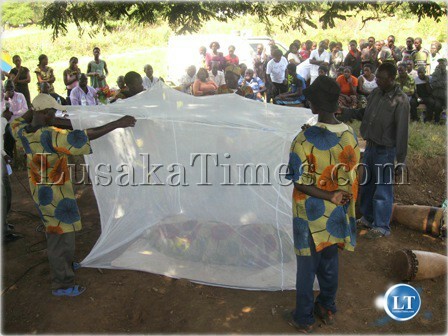 Acting District Medical Officer Steven Ngoyi said the Nets will soon be distributed in the district as a continuous exercise in eradicating malaria. The ITNs will be distribution among pregnant women, children under the age of five and grade one to three school going children as they are more vulnerable to malaria, he said. Mr. Ngoyi who disclosed this to ZANIS in an interview today. He said the District Medical Office will today begin the implementation of the Indoor residual spraying which will run for 35 days. He also disclosed that Mansa District has been exempted from the mass drug administration of Lymphatic Filariasis endemic popularly known as Elephantaisis since the district’s prevalence rate is below one percent. The mass drug administration will only be conducted in other district which include Milenge, Mwense,Mwansabombwe, Kawambwa, Nchelenge and Chiengi which have shown prevalence between one to about 53 percent. Lymphatic Filariasis caused by filarial worm Wuchereriabancrofti is transmitted through mosquito bites and the disease only manifests after a number of years. I pity the fish in the rivers of Luapula. These mosquito nets will be turned to fishing nets. you mean mosquito fishing nets, now fish crisis is looming.